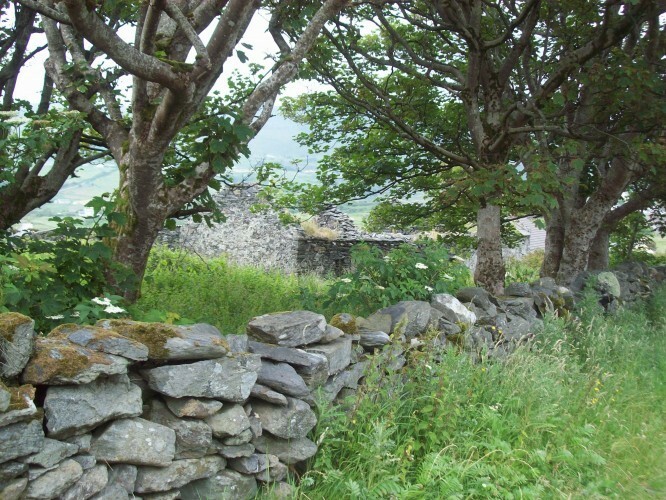 This post is the second in a series about the author’s 2013 trip to Ireland as a recipient of a Gaeltacht Summer Award from the Ireland-United States Commission for Educational Exchange. Q: Why are there so few roller coasters in Ireland? 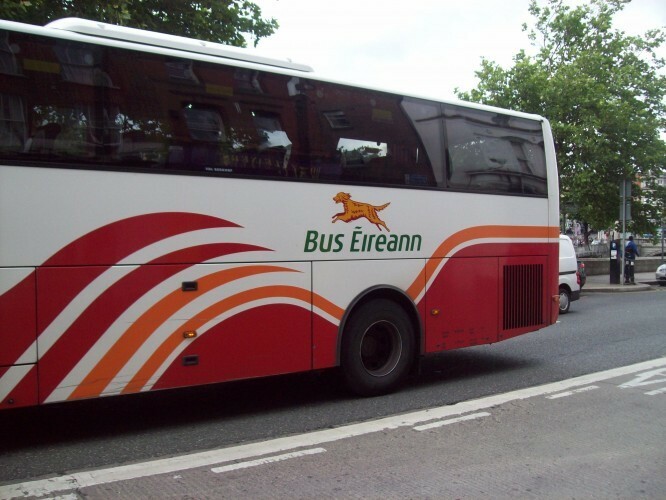 A: They don’t need ’em…they’ve got Bus Éireann! 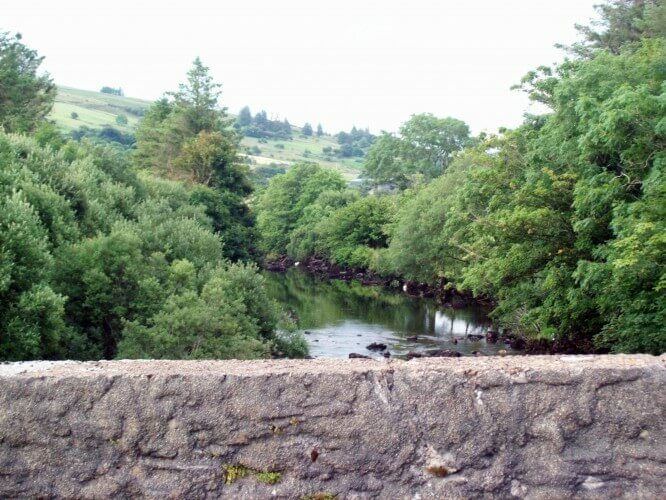 You can always tell the first-timers as they stumble off the bus in front of The Abbey Hotel…the ones who didn’t realize they suffered from motion sickness until they hit that “exhilarating”* stretch of road between Enniskillen and Donegal. The slightly green faces…the dawning realization that they’re going to have to take the same ride in reverse at the end of their stay. It’s enough to make the mom in me want to break out the tea and sympathy. For myself, though, I happen to love roller coasters (though my husband says that it was probably in poor taste for me to put my hands up and yell “air time!” as we flew over the bumps). Besides, I was going back to Oideas Gael…and for that, I’d brave just about anything! 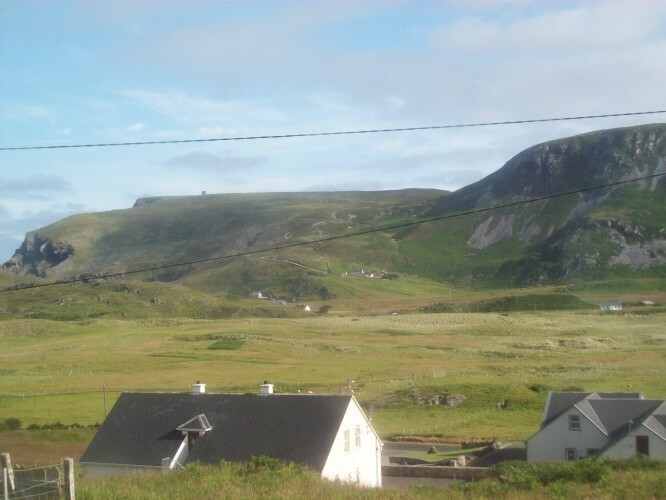 Some of you may recall that I first visited Oideas Gael, in Glencolmcille, Co. Donegal, in 2008, when I spent a fortnight’s Irish language holiday there. I learned a lot during that visit, and had a wonderful time doing so. At that time, however, I was still very much an advanced-beginning/lower-intermediate Irish learner, and my goal then was, more-or-less, to have fun while challenging myself to put my budding language skills to use. This time, however, I had a much firmer goal in mind: conversational fluency. What do we mean by “fluent”? For many language learners at a certain level, the new language is a little like a river…it flows along smoothly for a while, then suddenly – bam! – it runs into a dam.When the flow of language stops, the learner typically panics and falls back on his or her native language, if possible. Language learning is like a river! 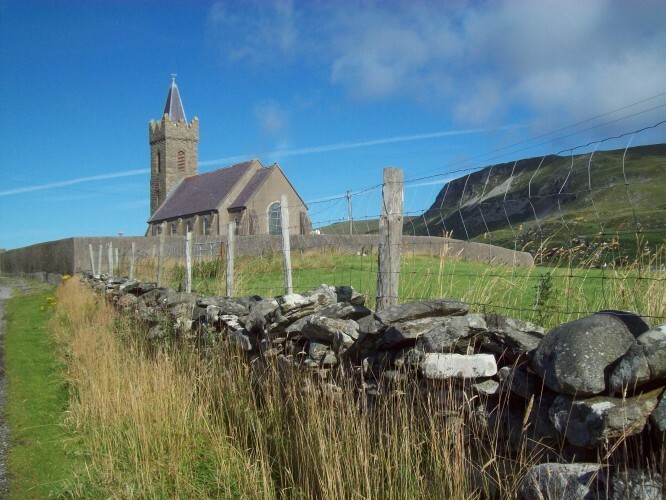 This picture was taken in Glenfin, Co. Donegal, where Oideas Gael offers language classes during the weeks at the end of July and the beginning of August. 2103 by Audrey Nickel. Minutes or hours later, the new language will start to flow again, as it finds its way past the “dam” (that’s when most of us have that “d’oh! I should have said…” face-palm moment!). The trick to developing fluency is figuring out how to get past the “dam” without losing the “flow” of the language. And the best way to do that is to put down the books and focus on conversation. Beautiful old church in the center of the glen. 2013, by Audrey Nickel. What I really love about Oideas Gael, however, is its conversational focus. As I mentioned in my “Holiday in the Glen” post in 2012, students there, particularly beginners, are discouraged from doing a lot of note-taking, as the primary focus is on hearing and speaking the language. For someone like me, the situation is just about ideal. For many higher-level learners, myself included, much of the difficulty surrounding speaking the language stems from a kind of performance anxiety. You get to the point where you have a lot of vocabulary and a pretty solid grasp of grammar and idioms. You can understand the spoken language reasonably well, and you can actually carry on a conversation when you’re feeling relaxed. When you get tense, however (such as when the conversational flow hits that “dam” and you can’t think of how to say what you desperately want to say), it’s like all your linguistic skills go out the window. What you need to do, when this happens, is just keep talking! Even if you have to dip into English for a sentence or two, or to make a mental note of the correct word, you keep on going! In academic settings, even if the people around you are supportive, this can be hard to do….at least for me. My internal dialog can’t seem to help saying “You poser! How can you make a mistake like that and still claim to speak this language! This is where the method at Oideas Gael really shines…getting people to let up on that nasty internal dialog and just TALK. I’ve already mentioned the conversationally based classes. While some grammar does happen (you really can’t learn a language without talking about grammar! ), the main focus, especially on the beginning levels, is on giving students the tools they need to hold a conversation. On the more advanced levels, the focus is on getting students to talk, and to keep talking past those conversational barriers. The social activities for which Oideas Gael is well-known are a lot of fun, it’s true. They’re also a huge part of the language-learning process. Céilí dancing, poetry evenings, movie nights, quiz nights, song sessions, concerts — even the evenings in the pubs and the twice-daily tea/coffee breaks — serve a very important purpose. They get the learner into a fun and relaxed space in which speaking the language is encouraged. It’s hard to get too hung up on the mistakes when you’re concentrating on the steps of a dance (and trying not to run into your neighbor!). The classes are fun too. Among the activities we did in class, some of my favorites included debates (“Resolved: Glencolmcille needs a McDonald’s!” Yes, we were just kidding. ), “speed-dating,” and a humorous rapid-fire conversation exchange involving the dreaded modh coinníollach (conditional mode). The thing is, just because you’re having fun doesn’t mean you’re not learning. In fact, the opposite is true…having fun makes it possible for you to learn more effectively. You relax, you make friends, you let go of your inhibitions. You find yourself trying more…worrying less about the mistakes. That’s a big (huge!) key when it comes to conversation. You CAN’T hold a conversation if you’re constantly running to the dictionary or the grammar book. You have to let go. Make no mistake: Fun as it is, it is work. I fell into bed every night and slept like a baby, utterly exhausted. I often made use of the breaks to go on long walks and recharge, emotionally and intellectually. But Lord, I did have fun! I made some wonderful friends, and I engaged with the language on a level beyond what I’ve ever done before. So what about those goals? Did I achieve my goal? I think, in a very real way, I did. But I’d also have to ask if those are reasonable goals for any language-learning program. “Am I more comfortable expressing myself in Irish than I was when I started this program?” Yes…definitely. In fact, I’d say that I definitely succeeded in bringing my spoken Irish up to the level of my ability to read and understand the language, which was my primary goal. “Have I learned to navigate those conversational barriers?” To a great extent, yes. I won’t say that I don’t still get tired, intimidated, or frustrated, but I have quite a few more tools at hand to get around those conversational “dams” (and I’ll write more about those methods in a later post). To my mind, these four weeks have helped me grow my Irish by leaps and bounds. I am a much better Irish speaker today than I was the day I left. And that, after all, was the whole point of the trip.